There are constant level of high attacks and port scans on Linux servers all the time, while a properly configured firewall and regular security system updates adds a extra layer to keep the system safe, but you should also frequently watch if anyone got in. This will also helps to ensure that your server stays free of any program that aims at disrupting its normal operation. The tools presented in this article are created for these security scans and they are able to identity Virus, Malwares, Rootkits, and Malicious behaviors. You can use these tools make regularly system scans e.g. every night and mail reports to your email address. 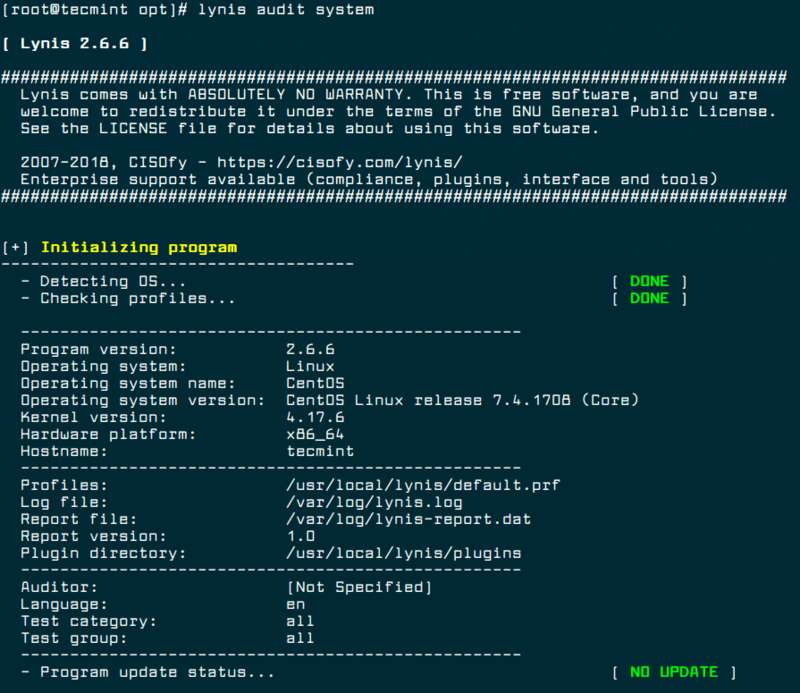 Lynis is a free, open source, powerful and popular security auditing and scanning tool for Unix/Linux like operating systems. It is a malware scanning and vulnerability detecting tool that scans systems for security information and issues, file integrity, configuration errors; performs firewall auditing, checks installed software, file/directory permissions and so much more. Importantly, it doesn’t automatically perform any system hardening, however, it simply offers suggestions that enable you to harden your server. We will install latest version of Lynis (i.e. 2.6.6) from the sources, using following commands. Now you can perform your system scanning with the command below. To make run Lynis automatically at every night, add the following cron entry, which will run at 3am night and send reports to your email address. Chkrootkit is also another free, open source rootkit detector that locally checks for signs of a rootkit on a Unix-like systems. It helps to detect hidden security holes. The chkrootkit package consists of a shell script that checks system binaries for rootkit modification and a number of programs that check various security issues. The chkrootkit tool can be installed using following command on Debian-based systems. On CentOS-based systems, you need to install it from sources using following commands. To check your server with Chkrootkit run the following command. Once run, it will start checking your system for known Malwares and Rootkits and after the process is finished, you can see the summary of report. To make run Chkrootkit automatically at every night, add the following cron entry, which will run at 3am night and send reports to your email address. RKH (RootKit Hunter) is a free, open source, powerful, simple to use and well known tool for scanning backdoors, rootkits and local exploits on POSIX compliant systems such as Linux. As the name implies, it is a rootkit hunter, security monitoring and analyzing tool that is thoroughly inspects a system to detect hidden security holes. The rkhunter tool can be installed using following command on Ubuntu and CentOS based systems. To check your server with rkhunter run the following command. To make run rkhunter automatically at every night, add the following cron entry, which will run at 3am night and send reports to your email address. ClamAV is an open source, versatile, popular and cross-platform antivirus engine to detect viruses, malware, trojans and other malicious programs on a computer. It is one of the best free anti-virus programs for Linux and the open source standard for mail gateway scanning software that supports almost all mail file formats. It supports virus database updates on all systems and on-access scanning on Linux only. In addition, it can scan within archives and compressed files and supports formats such as Zip, Tar, 7Zip, Rar among others and more other features. The ClamAV can be installed using following command on Debian-based systems. The ClamAV can be installed using following command on CentOS-based systems. Once installed, you can update the signatures and scan a directory with the following commands. Where DIRECTORY is the location to scan. The options -r, means recursively scan and the -i means to only show infected files. LMD (Linux Malware Detect) is an open source, powerful and fully-featured malware scanner for Linux specifically designed and targeted at shared hosted environments, but can be used to detect threats on any Linux system. It can be integrated with ClamAV scanner engine for better performance. It provides a full reporting system to view current and previous scan results, supports e-mail alert reporting after every scan execution and many other useful features. For LMD installation and usage, read our article How to Install and Use Linux Malware Detect (LMD) with ClamAV as Antivirus Engine. That’s all for now! In this article, we shared a list of 5 tools to scan a Linux server for malware and rootkits. Let us know of your thoughts in the comments section. Do you install one in particular over others or install them all? You can actually run more than one, on the same system or more so install all of them.